“YOU KNOW about the Nagas. I understand the Nagas.” It’s a line that A Rahman has got used to delivering each time he encounters some “ignorant outsider” who tells him about his/her borrowed perception of Nagaland and its people. Rahman’s claim to understanding his people is a valid one, too. Though Assamese in ancestry, the Nagaland Cricket Association (NCA) secretary was born in Kohima and has spent his entire life “growing up and living like a Naga”. “I can say with confidence that I know more about the Naga culture, the 16 official tribes and how each is different and their history than even these local boys here,” he says pointing at Neike and Kedua. The two youngsters of the Agami tribe (that is known for its rice beer) hail from the village of Sovima, which houses the NCA Stadium, and help around whenever there’s a cricket match being played here. They too agree with Rahman about Nagaland being a land of misconceptions and myths. “When I tell an outsider I am from Nagaland, the first thing they want to know is if I’m a headhunter?” says Neike, shaking his head. “I tell them with a stern face, ‘I’m not into it, but my forefathers certainly were’. You should look at their expressions.” Laughter all around. We’re seated inside Rahman’s office at the administrative building next to the stadium. It’s a two-storeyed complex that houses dorms for players, a gymnasium, dining halls and a number of offices. The wall behind Rahman is lined with schedules of the various teams printed on pieces of paper. ”Yes, yes it’s been madness,” he says having caught you glancing at them, “but nobody is complaining.” The first entry in the Ranji Trophy schedule is highlighted with a green marker. It’s been three days since Nagaland won that encounter by an innings and 333 runs after scoring 530/8, the highest-score ever by a debutant team in the competition. Rahman’s teenaged son, Tahmeed, was part of the team and became the youngest from the region to play in a first-class match. It’s an impressive looking stadium, modern in design with six floodlight towers and a grandstand that’s busily under construction, and should be ready by the end of the season. 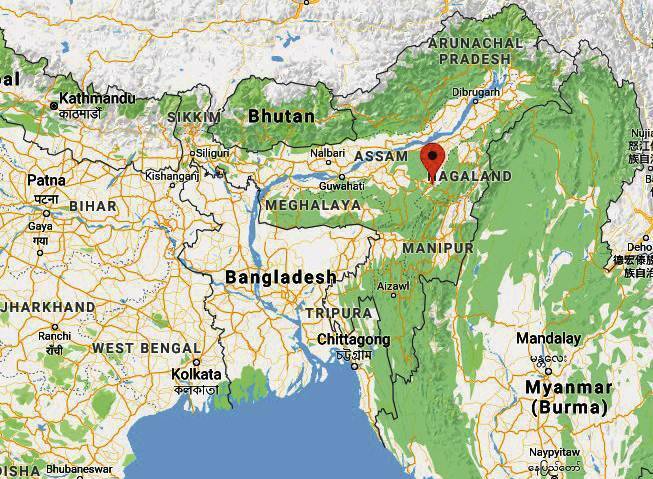 The venue, though 15 km from the city centre, comes under the Dimapur jurisdiction. This is the only plain region in the entire state, and the hills are quite a distance away — though you’re told the mountainous and tribal part of Nagaland starts only 5 km away from here. Sovima’s NCA Stadium is an impressive facility with six floodlight towers. “Match officials dread it when they see ‘Dimapur’ as their next assignment. But once they come here, they leave as ambassadors of Nagaland,” Rahman chips in with a wide grin. It’s also a sign of the mainstream Indian culture making some form of an inroad into a state that’s largely been cut-off from the country. This delayed entry of the sport in this region, as the locals point out, is also down to the fact that cricket’s inventors, the British, had limited influence on the Nagas even when they ruled the country. And the Nagas always take a lot of pride in reminding you of that. Whatever the reason, the present generation of Nagas are desperate to demolish such stereotypes. As soon as you step out of the station, you are swarmed by cab drivers coaxing you to go to Kohima, the scenic capital some 74 km away. But you require an inner-line permit to go past Dimapur, even as an Indian resident. Dimapur, therefore, is at once the gateway to Nagaland and, for the Nagas, to the rest of India. It has one of the biggest street markets in Asia, and it is at its busiest on Wednesday mornings as vendors sell everything from locally produced vegetables to souvenirs and also the world-famous Medziphema pineapple, seeds of which according to local reports have made their way to the Rashtrapati Bhavan garden recently. The auto ride to the stadium takes you past open-air butcher shops and animal carcasses, pork being the most widely available meat on offer. The roads are winding and pockmarked with massive potholes. “What else do you expect considering the corruption here and the fact that even the separatists run their own parallel government and we pay taxes to both them and the actual government,” a local explains. Though largely peaceful, the tension between tribals and non-tribals isn’t all too invisible. The last stretch before the stadium though is laced with opulence with massive houses on both sides. They boast of acres of open spaces while lush gardens abound. You do wonder how they must be transporting their fancy automobiles across this terrain, but some of the houses seem to have enough space not just for a helipad but an entire airfield. These include Rio Villa, which is where the chief minister, Neiphiu Rio, and his family members own houses. 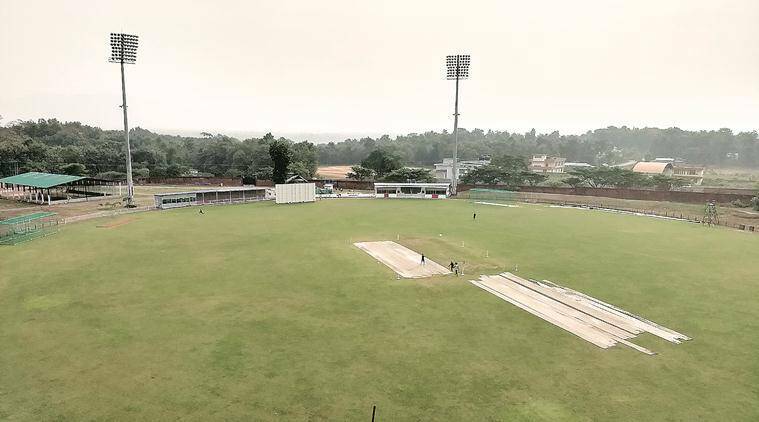 “He is a big fan of cricket and it was he who leased out his land to us to build the stadium and it was great to see him inaugurate the first Ranji match,” says Rahman. Thanks to its proximity to Dimapur, Sovima, home to around 800 of the Agami tribe, is a modern Naga village. But from the outside, with its ornate entrance, it looks very traditional. 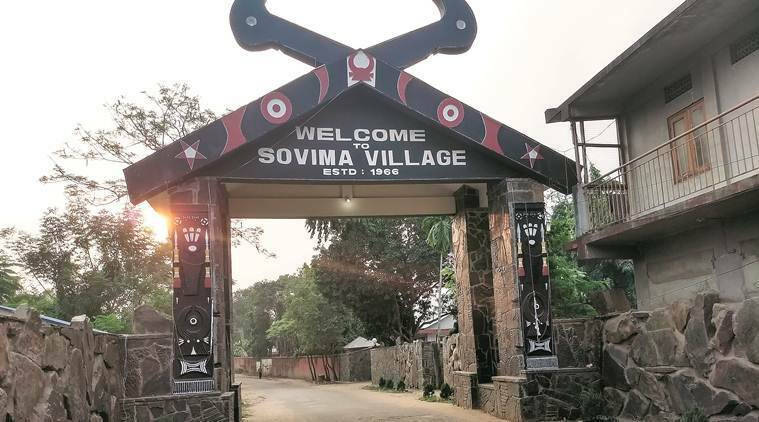 “It’s a tradition that’s followed everywhere that the village, however big or small, will have a welcome gate and the people of Sovima (where opening batsman Sedezhalie hails from) have kept that up,” says Rahman. Neike and Kedua are more than willing to not just show off their village but also give a guided tour of the neighbouring area. “The gate itself is called dahu and the stone wall on either side of it is called kharu,” says Neike while reminding you that each of the 16 tribes speak their own language, independent of the other. There are also signs of Mithul, the wild cow native to the region, which also happens to be the symbol of the NCA. Chumpo Museum is the first stop on the tour. It’s a tiny two-room institution run by a private family. And for all their efforts to break away from their head-hunting past — it’s the Konyaks who were most notorious for this practice — the museum is laden with remnants of that very activity. They include various weapons and skull memoirs. And also backpacks, where the hunters would keep the chopped-off heads. They come in different designs but only in one symbolic colour, black. The tour then includes an erstwhile sugar mill which has now been converted into a bamboo factory. The final stop is within the confines of Rio Villa, the summer house of the chief minister’s brother-in-law. It’s their attempt to show how safe and hospitable their state is, and they say so, too. The house is a three-storey bungalow with orchards and gardens around, and nobody stops you, even as we walk up the steps of the back corridor to catch a glimpse of the “best view” in Dimapur. “See, this is how friendly we are as people, and we’re always glad when someone comes here to understand the real Nagaland,” says Kedua. Just like the delayed arrival of cricket presents a unique opportunity for those who know about Nagaland to understand Nagaland a little better.